This software accompanies the paper Support vector machine training using matrix completion techniques by Martin Andersen and Lieven Vandenberghe. The code can be downloaded as a zip file and requires the Python extensions CVXOPT and CHOMPACK 2.3.1 or later. We welcome feedback, and bug reports are much appreciated. Please email bug reports to martin.skovgaard.andersen@gmail.com. 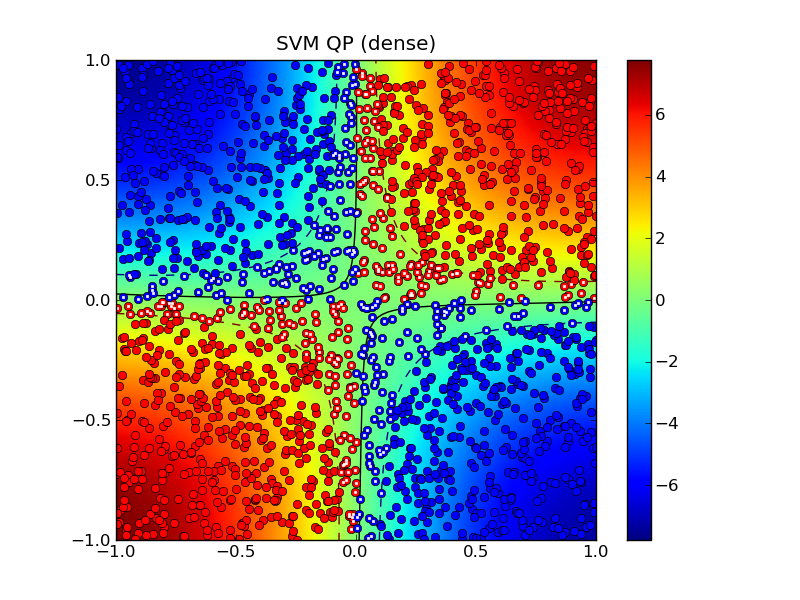 This software provides two routines for soft-margin support vector machine training. Both routines use the CVXOPT QP solver which implements an interior-point method. The routine softmargin() solves the standard SVM QP. It computes and stores the entire kernel matrix, and hence it is only suited for small problems. The routine softmargin_appr() solves an approximate problem in which the (generally dense) kernel matrix is replaced by a positive definite approximation (the maximum determinant positive definite completion of a partially specified kernel matrix) whose inverse is sparse. This can be exploited in interior-point methods, and the technique is implemented as a custom KKT solver for the CVXOPT QP solver. As a consequence, softmargin_appr() can handle much larger problems than softmargin(). (with variables , , ). The kernel matrix is given by where is a kernel function and is the i’th row of the data matrix , and is an -vector with labels (i.e. ). If is singular, we replace in the dual with its pseudo-inverse and add a constraint . The kernel parameters , , and are specified using the input arguments sigma , degree , and theta , respectively. 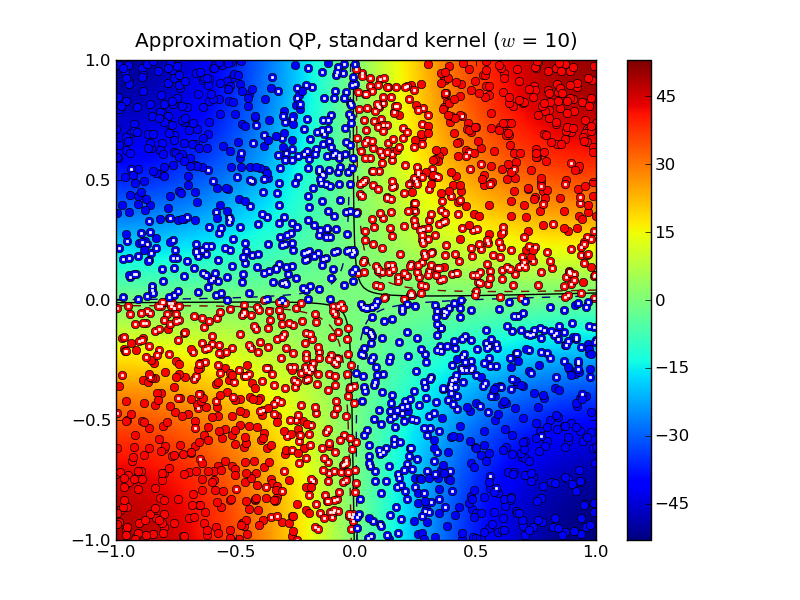 The kernel matrix is the maximum determinant completion of the projection of Q on a band with bandwidth . Here where is one of the kernel functions defined under softmargin() and is the i’th row of the data matrix . The -vector is a vector with labels (i.e. ). The half-bandwidth parameter is set using the input argument width . As a toy example, consider the following classification problem with two (nonlinearly) separable classes. We use as training set points in generated according to a uniform distribution over the box . We assign labels using the function , i.e., points in the first and third quadrants belong to class 1 and points in the second and fourth quadrants belong to class 2. We remark that in this simple example, the degree 2 polynomial kernel can separate the two classes. The following Python code illustrates how to solve this classification problem using each of the two routines provided in SVMCMPL. 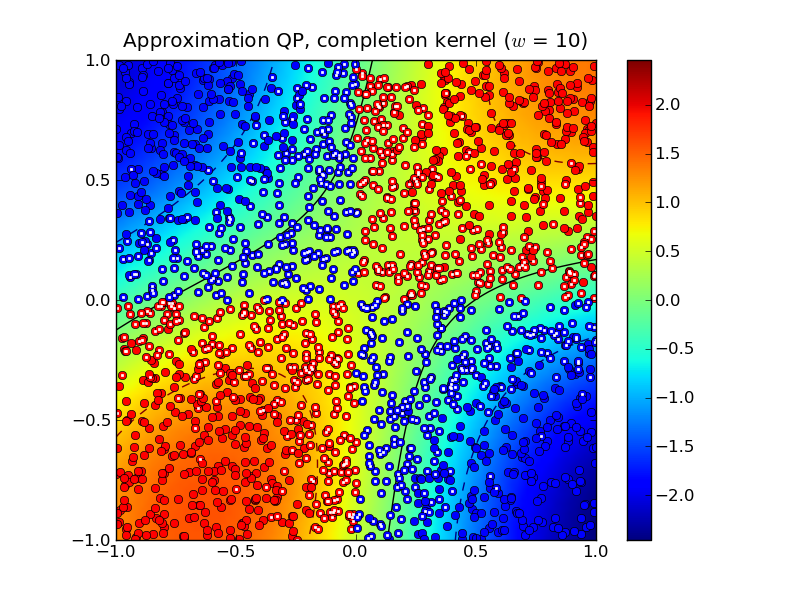 In this example we solve a problem instance with 2,000 training points, and we use and the RBF kernel with . The solid curve marks the decision boundry whereas the dashed curves are the -1 and +1 contours of where is the decision function. Solving the approximation problem with half-bandwidth produced 1,054 support vectors. In this example, the standard kernel classifier is clearly better than the completion kernel classifier at this bandwidth. Increasing the half-bandwidth to produced 467 support vectors. Notice that both the standard kernel and completion kernel classifiers are now nearly identical to classifier obtained by solving the standard SVM QP. Solving the dense SVM QP required 7.0 seconds whereas the approximation QPs required 0.3 seconds and 0.7 seconds for and , respectively. The following example demonstrates the approximate SVM method on the MNIST database of handwritten digits. In the example we use the Python module mnist.py to read the database files. The following code trains a binary classifier using as training set 4,000 examples of the digit ‘0’ as class 1 and 4,000 examples of the digit ‘1’ as class 2.
images = images / 256.